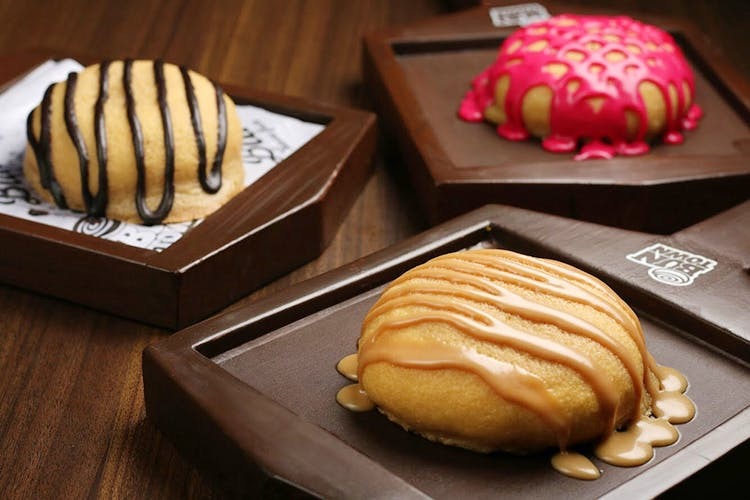 Just like the Papparoti franchises popping up all over, BTM’s Bun Town is serving up all kinds of buns and other delicious bakery bites. Ladies and gentlemen, we think we have found the ultimate spot for the perfect chai break in Bun Town, a little bakery kiosk in BTM Layout. What sets this place apart from the Iyengar Bakery in every neighbourhood is the wide selection of buns, both sweet and savoury. If you’re familiar with Malaysian coffee and bun chain Papparoti, this will be a recognisable setup. Here you can order a hot cuppa and pair it with a soft and buttery bun. They’ve got quite a few options to choose from. Veg, chicken tandoori, peri peri and egg buns are some of the savoury dough on offer. If it’s sweet buns you seek, classics like cream buns and jam ones also peek through their display case. Our pick for the best bun here (hands down) would be their Roti Buns. A Mexican recipe, roti buns are a fluffy and buttery milk bread bun that are crispy on the outside and soft on the inside. At Bun Town, they serve many different variations of the roti bun from Red Velvet Roti Buns to Oreo, KitKat and Nutella options and these are simply delish. They don’t go easy on the butter either, which makes this quite the indulgence. Pair your chai with a bun here and you’ve got yourself a killer combo. They’ve got quite a few coffees and teas on the menu, and milkshakes and smoothies as well. They have classic bakery bites too! We’re talking tea cakes, muffins, brownies and yummy doughnuts. Grab your goodies and head to their cosy seating space complete with simple chairs and tables, and ambient lighting. But if that’s full (we did say it was cosy) just kick it old-school and stand outside this cutesy kiosk during your snack break. Bun Town currently has only one outlet in the city, but have plans to launch in 11 different locations soon.